Today Shacknews is reporting that Diablo III will be open to the public for beta testing. The open beta weekend begins this afternoon at 12:01pm Pacific, then will run until 10:00am on Monday, Blizzard explains in a Diablo blog post. All you need to play is a Battle.net account. You can download the client in advance, so you don't miss a second. 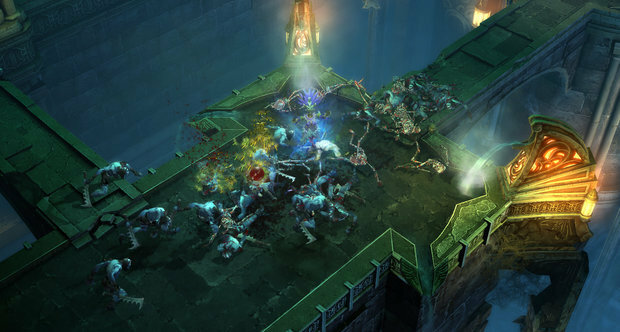 The beta is relatively small, packing the first part of Diablo III's first act, but you will be playing Diablo III. Unlike proper closed beta testers, open beta players won't receive 'Beta Bucks' to spend in the auction house and cannot post in the beta forums. Diablo III launches for PC and Mac on May 15. The closed beta test will wrap up on May 1.
woot! DIII here I come haha. now i can see how well my comp can handle it. Already stocked up for the weekend. im ready for some DIII\Nuclear war. Meh Ill wait for the reviews. Ive also seen betas rip apart machines breaking all kinds of other programs. I'm getting it now! Thanks bud! I don't care if its gone through 500 patches. Beta is beta. Ill wait for reviews and maybe a demo. Sweet open beta. This will probably determine if I buy the game or not. Also, reviews are the worst way of determining whether a game is good or not. What I do is I watch/read reviews just to get the idea of how the game plays. I don't even care about what the reviewer's decision/opinion/rating is. I decide on my own. Do you really think the gameplay is going to change that much in the next 3 weeks from where its at now? It'll just add some polishing..etc. Game is already set basically. i do agree this game is pretty set. beta is beta sure - but blizzard is not all other companies. as much as i don't like the current art style and i think they simplified the skill system (while admittedly developing the combat system more) - the one thing i will say is they know what they want to do. also, no matter what anyone says - they listen to their brand fans less than most companies, even moreso since activision. they listen to $$$ only, no longer the innovative powerhouse they once were. what i'm saying it - this is a preview, not a beta. the game will not change in any significant amount between this beta and release. they are testing servers, economy, etc - gameplay mechanics etc are set in stone. You have never worked with a true beta I assume. Ive done closed door testing for some pretty big games in the past. A few AAA titles. Most open betas are demos. Real betas will tear a rig up if you ain't careful. Ahh those kind of betas. Yeah they I can imagine are very unstable but this is more like a demo than anything else. So why don't you try it? Didn't you play the BF3 beta btw? Most open betas are demos. Real betas will tear a rig up if you ain't careful. In other words: make a disk image of your system before installing the beta, and back up your data files periodically. If the beta does mangle your setup, you can restore it back to the way it was.